Want to give them the grandest dozen flowers? Our new Floral Collection will be just the bouquet! Everyone loves flowers....and cookies! 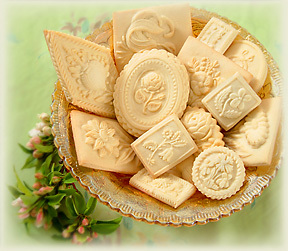 Especially these floral springerle cookies. Surely, they'll be the most unique dozen flowers anyone has received. . A baker's dozen of various flowers including the happiest violet to the most delicate rose. Largest cookie 5". Available in lemon or anise flavour.